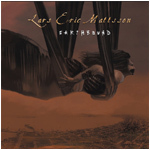 "Earthbound" was Lars' first instrumental release in over 14 years when it was originally released in 2005. In october 2014 Lars released a remixed version that also includes the bonus track "Five Lanes". Earthbound found Mattsson in an eclectic mode with open arrangements and playing right from the soul that travels from the melodic to the progressive. On the album Lars comments, "After finishing my progressive metal rock opera "War" earlier this year I felt the need to do something that was quite the opposite, so I took an almost minimalist approach and as opposed to what you hear on "War". My new solo album Earthbound is just me and a drummer, as few instruments as possible, no vocals and very little keyboards, so it really is a guitar album in every aspect. It's not overblown when it comes to production and recording with the aim to keep things simple while still exploring new territory." • Song of the Wood.